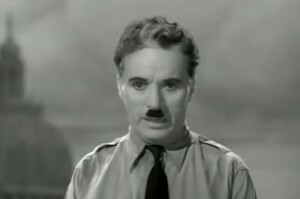 This is a video of The Great Dictator Speech, a moving part of a film that, while different that the Chaplin films that preceded it, still had him in his trademark (and copied) little mustache, the last time he wore it in a film. This was made even before Hitler had begun the cataclysmic second world war, and in many ways this departure for Chaplin mocks him thoroughly. Chaplin plays a Jewish barber who through a chain events gets mistaken for the dictator, eventually replacing the dictator due to this mistake, the speech being opposite than expected by the populace, and opposite all that the real dictator stood for.